Beautiful watch. It goes with everything. I like to layer it with my bracelets and makes it even better. I bought it for my sister but kept it after I opened it. Bought her the same kind too, she is thrilled. Very reasonable in price too. Will be getting few more as gifts. 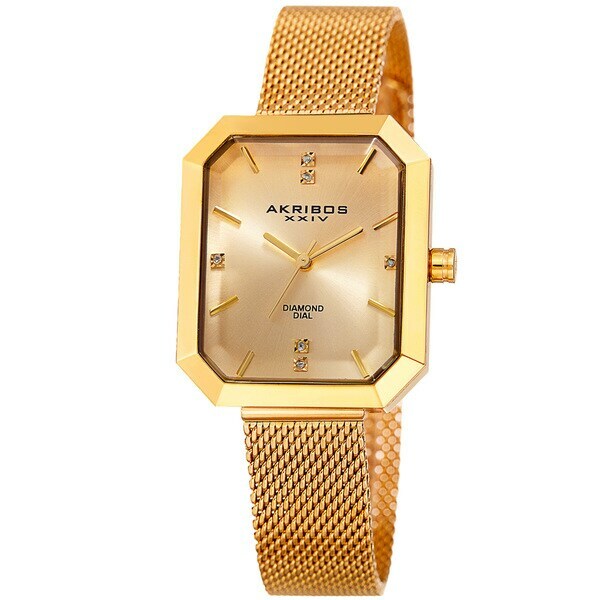 This beautifully crafted timepiece from Akribos XXIV features a unique octagonal case with a beveled bezel. The radiant dial is adorned with dazzling diamond markers. Powered by a precision quartz movement, this watch is sure to be accurate and reliable. This watch is lovely; looks very elegant and keeps perfect time. Love it! Exactly what the picture shows; face a little bit larger than I anticipate for a small wrist. This item arrived as expected. It is comfortable and runs well. It arrived in timely fashion. I am quite pleased. It is just as it looks --- probably not worth much more than I paid. Pretty but not worth the price that was quoted.